to help as many people as possible to test the (not yet released) GNOME-Shell (and GNOME 3), I've been working on a test image, which can be easily burned on any CD or dump on USB sticks, without the hassle of compiling the entire GNOME 3 stack with (the excellent) jhbuild. This image does not modify your system in any way. This image does not contain proprietary drivers (ie no Nvidia nor ATI fglrx proprietary drivers). This image is a persistent image : if you dump it on a USB stick, the first boot will be very long (don't worry) because the free space on the USB stick will be allocated to store the changes done on the running image. User name on the image is tux and password for this user and for root is linux. Initial version of this image was created with the excellent SUSE Studio appliance generator but starting with this version, I'm using kiwi (which is also used by SUSE Studio) and OBS to generate the image directly on our build infrastructure (where GNOME 3 packages are also being build for openSUSE). You can download this image (in both x86 and x86-64 flavors, but I didn't test the 64 bits version yet) from http://download.opensuse.org/repositories/GNOME:/Medias/images/iso/ (file with the name starting with GNOME_3). Live install is also available (but hidden ATM) in the image : just add "liveinstall" on the boot command line and you will get the live installer which will allow you to install the image on your favorite computer. Thanks Federico, I didn't list Aaron tool because the "old" version I was testing was still depending on devkit-disk, which is now fixed. I've updated the blog post. Thanks for this. This saves me from having to go through the arduous task of having to compile Gnome3. I'm going to have to give it a try. Any chance you could add the VirtualBox guest utilities and drivers to the image? Congratulations for having created this LiveCD. I entered your creation in my blog (Italian). I'll need more informations on your system, your system logs, etc..
switch to a text terminal (Ctrl-alt-F1) then log as root (password is "tux") and run /sbin/supportconfig and upload the generated tarball somewhere I could download it. Thanks. @prangija Could you drop me an email so we try to see what is failing ? Sorry, I did not specify I did burn the image on cd, no usb stick currently availlable. 3/ same for MacBooPro (but it might be nouveau driver which is too old for your laptop). Tried to use supportconfig on the mac, but I have currently no way to transfer the file since the wlan does not work. I'll try to get a stick and what I can do. I'll try tomorrow with the Acer (works fine in 3d with both proprietary and oss drivers on Mandriva 2010.2, at least with compiz and google earth). thank you for providing the image! I am writing from my Dell Mini running the liveusb. The only problem is with the wireless, but I have a broadcom so it's probably just the firmware missing. I wanted to compare this "pristine" installation with my b0rked one on my Debian Sid install... I must be missing a few packages! Thank you and if you need testing just say so! Thanks Fabio for your kind words. Broadcom firmware is not included (for obvious licence reason) but it can be found on Packman repository (google for broadcom-wl opensuse and you'll find it). I hope future kernel with some free software driver from Broadcom will be able to fix this the right way. But it looked ok, and I thought it was obvious how to start or quit programs. My Mom finds this computer, running Ubuntu and Gnome, quite hard to use. Hopefully the upcoming Gnome3 will be an improvement (if I decide to install it). Thanks for making this USB image. I had tried using JHBuild to build the gnome desktop. (I had originally only wanted to try the latest Rygel ... but it's too deeply immeshed, I guess, to use anything other than JHBuild to build it and everything else.) Then I wanted to really try Gnome Shell, but also failed getting JHBuild to do that without error. @crf could you give informations on the graphic chipset on your system ? I have some lockups on some specific nvidia systems. It worked very well on live CD. Thank you very much, it permitted to me to see the last evolutions. It's getting better and better, I'm fan! here's lspci output, while running Ubuntu. How often do you update the live image? Or are there no updates planned? The latest VirtualBox, Debian Squeeze, your ISO (thank you!) 64-bit -- it crashes when booting. Somewhere just after "starting syslog services" -- simply VirtualBox window (with guest) disappears and that's it. -running Ubuntu 10.10 (sorry...) on a USB stick (no money for the HDD at this moment )with ATI/Catalist (proprietary) drivers very well! just to complement my comment here: i'm not a hacker/programmer, just a ordinary user. @lothar I plan to update the image every week or every two weeks. @Photon I'll rebase the image on openSUSE 11.4 as soon as it is released (or maybe just before), it should improve nouveau support. @macias as noted in my blog post, don't really expect VirtualBox to work with gnome-shell, at least now. I'd suggest you report this issue to Virtualbox developpers. @Edson the image is not using the latest version of Mesa driver for ATI, so it might explain the poor performance. I'll try to update them (not sure when). I don't think it is Gnome that crashed, there was not even blink from X starting. @macias : well, the image is shipping with Virtualbox 4.0.x guest addition, you might want to try to run it with latest virtualbox. Maybe try the 32bit image. 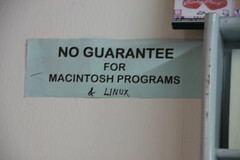 But don't expect gnome-shell to work in it. Thanks for this gnome-3 image. Very helpful. I'd compiled using jhbuild but recently have been unable to get a session going. In case anyone else hits this: after updating today to v2.91.91, I found that I couldn't edit the panel. There was a recent change to require use of the 'alt' key when right-clicking, but this didn't work for me. Instead, I rebuilt gnome-panel from source, editing panel.c to remove the modifier check. Now I can edit the panel again. @mcdavey: you should double check your alt key is correctly detected as such (could be incorrect keyboard mapping). Otherwise, I'd suggest to fill a bug upstream.